To experience a holiday in Budapest is to revel in one of the world's most beautiful cities, which not only offers breath-taking classical architecture but also stunning vistas across the wide, romantic Danube River. There are many vantage points in this city of hills, spires and rivers from which to admire panoramic views, including Gellert Hill where you can also find the famous Citadella and the Liberation Monument. Budapest is also a city of festivals, concerts and the arts and a popular reason to visit is for the city's renowned operatic and music events as well as its amazing galleries and museums. For the less artistic there are also hedonistic pleasures to be enjoyed, like rejuvenating in Budapest's famed spa baths, sampling the wonderful local cuisine in the city's many good restaurants, or enjoying the feisty and fun Budapest nightlife. There is great shopping in the city as well and those so inclined will leave with substantially heavier bags. Budapest is a city for all to enjoy. It can provide a romantic getaway for two, a memorable experience for music or opera fundis, fun for families, fascinating fodder for sightseers, or a rocking time for festival goers. Summer (between April and September) is undoubtedly the best time for a Budapest holiday, when long days are generally sunny and warm, albeit with a little uncomfortable humidity. Snow is common in winter. Most choose their time to travel to Budapest to coincide with one of the major events, like the Sziget rock festival or Formula 1 Grand Prix in August, or the Summer Classical Music Festival. Read more on Budapest's Climate and Weather. -Visit the Royal Palace on the top of the famous Castle Hill. -Admire the magnificent views from the ramparts of the neo-Romanesque Fisherman's Bastion. -Marvel at the Great Synagogue in the charming old Jewish quarter. -Wander through the striking Communist relics of Memento Park. -Stroll over the iconic Chain Bridge, built in 1849. -Take a tour of the richly decorated Parliament Buildings with their treasure trove of art. -Treat the kids to a day of fun at the Great Circus. -Explore the picturesque village of Kecskemet with its colourful Art Nouveau buildings. Budapest is a great base or starting point for further excursions into Hungary. Eger, one of the country's oldest cities, is popular for its historical attractions and Baroque architecture but also because it is nestled in the centre of Hungary's wine-growing region, a delight for tourists who tipple. Lake Balaton is the largest freshwater lake in Europe and attracts many to the lovely villages and resorts that line its banks. The scenic area of the Danube Bend is also easily accessible from Budapest. Budapest Franz Liszt International Airport, the largest of Hungary's five international airports, is conveniently located 10 miles (16km) southeast of Budapest. 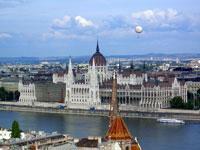 Get more information on Airports in Budapest. -With 123 thermal springs Budapest has far more than any other capital city in the world. -Budapest has the oldest underground train system in mainland Europe - it was built in 1896. -Before 1873 Budapest was three distinct cities: Buda, Pest, and Obuda. Known as the 'Queen of the Danube', magnificent Budapest exudes a cultural sophistication that entices and enchants. It graces both sides of the river with grand historic buildings, regal bridges, and graceful tree-lined boulevards. The city's elegant beauty and romantic atmosphere has given it Parisian status among the Eastern European countries. Budapest offers the visitor the familiarity of European grandeur with a distinct Hungarian flavour. This is evident in the neo-Gothic Parliament buildings, sidewalk cafes, and Magyar cuisine; classical concerts and Hungarian folk music; and the cobbled streets of medieval neighbourhoods and shady parks. Highlights for visitors include a river cruise on the Danube and a thermal bath in one of the Turkish-era bathhouses. Budapest was originally two cities built on either side of the Danube, namely Buda and Pest. The two districts are still distinct in their contrasting makeup. The older and more charming Buda comprised of atmospheric cobbled streets, little picturesque coloured houses, and a medieval, neo-Classical mixture of architecture set among the gentle hills of the west bank. It is famous for its historic Castle Hill, featuring the Royal Palace; museums and galleries; St Matthias Church; and the ramparts of Fisherman's Bastion. Pest lies on a flat plain and is the commercial core of the city. It bustles with fashionable shopping areas and has characteristically wide, leafy boulevards. Andrássy Boulevard is the Champs-Elysées of Budapest, lined with a typical mosaic of architectural styles and buildings with the enormous Heroes' Square at the end. A history of numerous wars and invasions, with repeated destruction and rebuilding, has created the Budapest of today, with an amalgamation of styles, created over time during periods of loving restoration by a proud and resilient nation of people; it is a city of charm and character and never drops out of favour with travellers.